On 14 January, which is both New Year’s Day and the Feast of St. Basil according to the old Orthodox calendar, villagers in Bulgaria and Macedonia perform the costumed ceremonial dance known as Сурва (Surva, “unripe year”). 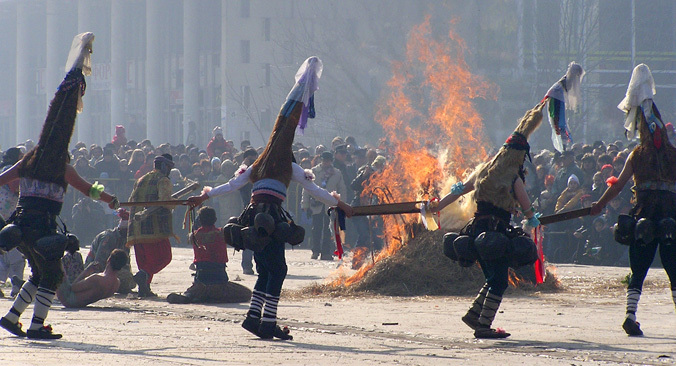 Children between 4 and 14 years old participate in the малечка Сурва (small Surva), while adults between 15 and 35 perform in the голема Сурва (big Surva). On the eve of the event, youths go from house to house collecting wood for the ceremonial bonfire. In the morning the participants choose their roles and don the corresponding masks and sheepskin capes. The stock characters may include a groom, a bride, a devil, a priest, a gypsy, and a dancer with a bear. To the accompaniment of drums and shawms, the dancers parade through the village with abundant comical antics. The ceremony culminates with a spirited dance around the collective bonfire. This according to “Сурварските обичаи од неколку струмички села” (Old customs performed on New Year’s day in villages of the Strumičko region) by Ivan Kotev, an essay included in Rad XIX kongresa Saveza Udruženja Folklorista Jugoslavije (Skopje: Združenie na Folkloristite na Makedonija, 1977, pp. 207–212). Below, Surva in Krupnik, Bulgaria.